Connect network cables to the 1 GbE or 10 GbE connectors on the NEM. For 4P systems connect cables only to slots 0 and 3. 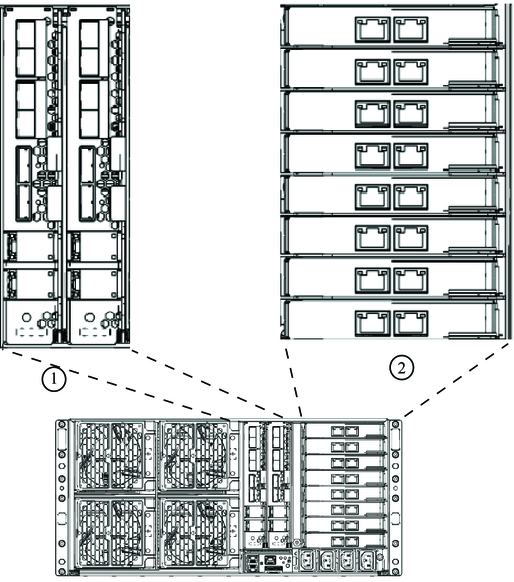 4P systems contain CPU modules in slots 0 and 3, and filler panels in slots 1 and 2. For 8P systems, connect cables to slots 0, 1, 2 and 3. 8P systems contain CPU modules in all four slots. Connect Gigabit Ethernet, InfiniBand, or Fibre Channel cables to the connectors on each of the PCIe EMs. See your PCIe EM documentation for details. 4P systems support PCIe EMs in slots 0.0, 0.1, 3.0, and 3.1 (the top two and bottom two). 8P systems support PCIe EMs in slots 0.0, 0.1, 1.0, 1.1, 2.0, 2.1, 3.0, and 3.1 (all slots).